I’ve come to the conclusion that coconut is the most magical paleo ingredient. It comes in flakes, milk, flour, and other forms, and it’s a true nutritional powerhouse. These blueberry muffins made with multiple coconut ingredients to support your health—not to mention, coconut tastes great, too! I love cashew butter in muffins because it makes them so rich and delicious, and adds lots of protein. These blueberry muffins also have pumpkin puree and chocolate chips, and are just gently sweetened with banana and a little bit of honey. 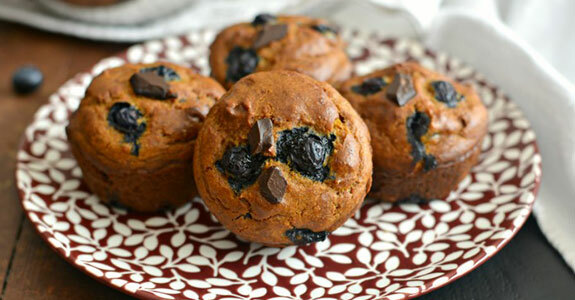 What’s not to love about a muffin that has both blueberries and chocolate? If you’re more of a green smoothie breakfast person, but you’re looking for something not so chilling on cold mornings, give this breakfast porridge a try. It’s full of blueberries, cucumber, hemp seed, chia seed, manuka honey, coconut milk, and more. If you’re expecting a porridge flavor, you’ll need to open up your mind a bit, but this is delicious! These scones are made with almond and arrowroot flours and they have the amazing flavor of fresh blueberries combined with the sharp brightness of crystallized ginger. 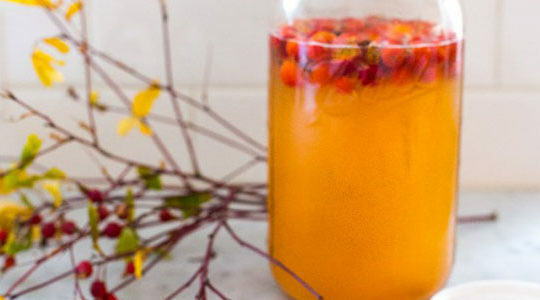 You’ll love this combination, and it’s super to wake you up first thing in the morning! All of us have days when we’re feeling run-down and could use an immunity boost. This smoothie does the trick with powerful ingredients like blueberries, chia seeds, and almonds. It’s super creamy with almond milk, and a little maple syrup sweetens it up if necessary. Looking for a light and sweet blueberry dessert that’s simple to make? 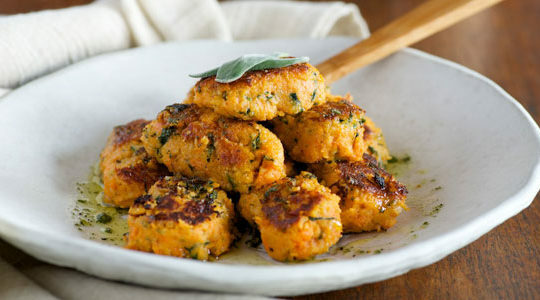 This one takes just 10 minutes to prepare and then the refrigerator does the rest of the work. You’ll need fresh blueberries, coconut sugar, coconut cream, and some grass-fed gelatin powder. This one’s made with almond and coconut milks, so it’s super creamy and delicious. Frozen banana keeps it sweet and extra frosty, while basil adds a lovely herbal twist to the flavor. A handful of spinach adds nutrients while hiding behind the pretty purple color. This easy muffin is perfect for when you just need a single treat either for breakfast, dessert, or a snack. It’s made with coconut and almond flours, sweetener of your choice (coconut sugar would work well), mashed banana, cinnamon, and blueberries. Make it in the oven or the microwave. This rich and dense cake is so delicious, made with almond and coconut flours and darkened with raw cacao powder. It’s sweetened with coconut sugar and raw honey, made moist with full fat coconut milk, and studded with beautiful blueberries. Top it with this thick chocolate ganache. 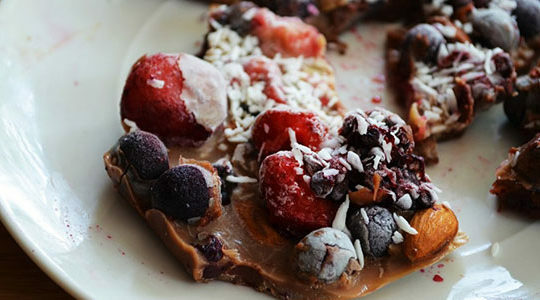 Everyone loves a nice paleo waffle. 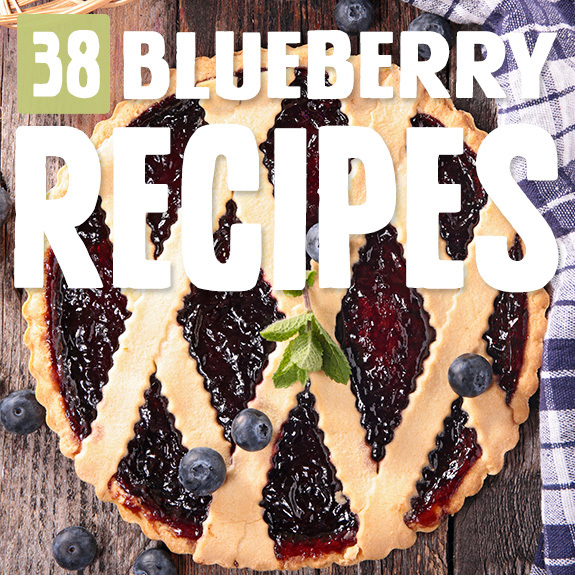 We eat them on Saturday mornings at my house, and I’m looking forward to trying this blueberry version with almond butter, mashed banana, cinnamon, almond extract, and just a touch of coconut flour. So much protein! 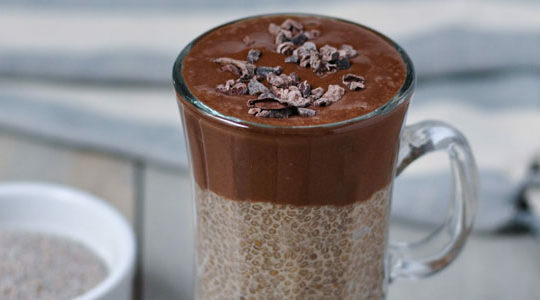 You can do chia pudding the simple way or the fancy way, and even this fancy way is pretty simple! This is a great easy dessert to serve to guests, and it’s made with just coconut milk, chia seeds, blueberries, maple syrup, vanilla, figs, and hazelnuts. It takes just a few minutes to put together and sets in the fridge. I like panna cotta well enough, but sometimes I just feel like I’m eating milk jello, and I’m not a huge fan of that. 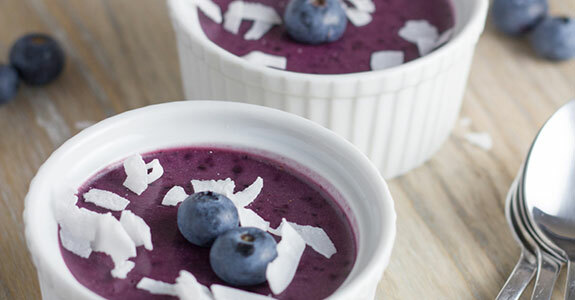 But this recipe is rich and flavorful and takes on a quality all its own with cacao butter, blueberries, and full-fat coconut milk. It’s sweetened with xylitol, but you could also use stevia or even maple syrup. This incredibly easy breakfast, snack, or dessert for warm days has only two ingredients plus whatever you want to use for toppings. Just blueberries and frozen banana! Top with more fruit, nuts, and seeds or eat it plain. I’m a popsicle fan, and I always think the creamy ones are best. This one’s both fruity and creamy, with the lovely sweet-tart combination of blueberry and lemon and the creaminess of coconut milk. It’s sweetened with banana and honey! If there’s one thing I love more than popsicles, it’s ice cream! I’m super excited to share this healthy ice cream made from a base of cashews and avocado with coconut milk, coconut nectar to sweeten, vanilla extract or vanilla bean, and mashed blueberries. The great part about this recipe is that it doesn’t mess around with technique. Making chocolate covered blueberries would normally involve dipping small berries and trying not to let too much of the chocolate drip off. This recipe makes it easy! This pretty lavender-colored cake is made with an almond-coconut-date crust and a rich, creamy filling of cashews, coconut milk, and coconut oil. 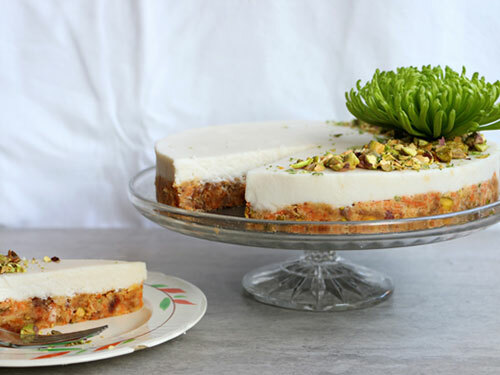 This combination creates a lovely texture that is, in my opinion, even better than traditional, over-sweetened cheesecake. A brief respite from desserts gives us this beautiful rainbow salad topped with all manner of fruits, including blueberries. 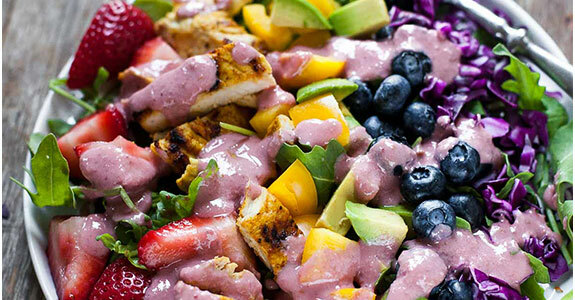 It’s a super healthy salad, and you could even involve the kids when making the colored layers. Maybe they’ll even eat it! 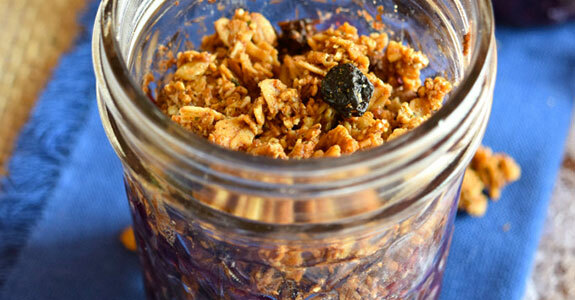 This low-carb fruit crumble is made with delicious, sweet cooked blueberries and a topping made from crushed nuts and nut butters. The recipe calls for peanut butter, but feel free to use whatever nut butter you’d like—almond is an obvious choice while cashew is amazing. This delicious cobbler is a perfect breakfast for days when you want something sweet and warm, but still rich in protein. It’s made with cashew butter, honey, eggs, coconut oil, cinnamon, lemon zest, and blueberries, and it’s totally amazing. Fruit compotes can be used for just about anything you want, and are especially good atop homemade pancakes and waffles. This blueberry compote is super simple to make with just blueberries, vanilla, and a little coconut sugar. You’ll love it over waffles! 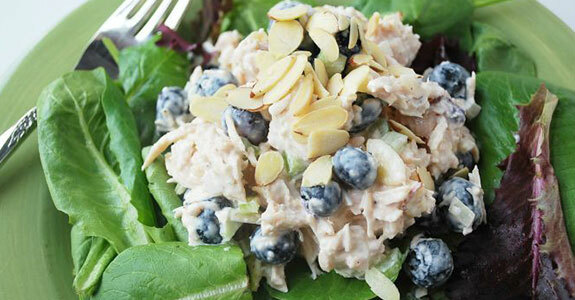 Here’s another savory dish you can make with those fresh, juicy blueberries, and this one involved chicken, celery, Vidalia onion, toasted almonds, and homemade paleo-friendly mayonnaise. Drooling yet? Just take a look at the picture and you will be. I love thumbprint cookies, but not so much their sugar and refined grain content. This healthier version is made with almond, tapioca, and coconut flours, and filled with a deliciously spiced blueberry topping with maple syrup, ginger, and cinnamon. These creamsicle bars have a chewy, soft texture with a base made from cashews, almonds, shredded coconut, and coconut nectar. The sweet, purple topping is just blueberries, cashews, coconut nectar, coconut butter, and coconut cream with a pinch of salt. Move over, oranges and cream! Blueberry is the new creamsicle in town. This yummy mojito is for adults only, and it has a fantastic combination of flavors with fresh mint, coconut sugar (in place of the raw sugar), hibiscus petals, limes, blueberries, sparkling water, and white rum. It’s a perfect afternoon summer cooler! You could even make a virgin version for the kids by replacing the rum with white grape juice. These easy scones are a lovely breakfast treat made with almond, tapioca, and coconut flours and sweetened with a touch of honey. They’re studded with sweet blueberries and—my favorite part—topped with a silky coconut cream-based honey-lemon glaze. These deliciously fruity berry bars are perfect for breakfast and are lightly sweetened with date paste or honey. 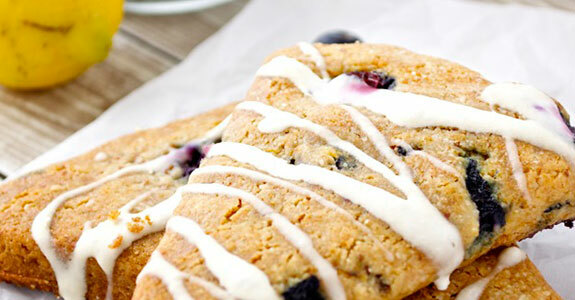 They get their awesome flavor from almond flour, lemon zest, fresh blueberries, and a touch of vanilla extract. Super simple, too! It can be tough to follow restrictive diets, and while it’s good to focus on what you can eat instead of what you can’t, sometimes you just miss muffins. So these AIP muffins are perfect, made with coconut flakes, plantain, banana, gelatin, coconut flour, cassava flour, and blueberries. 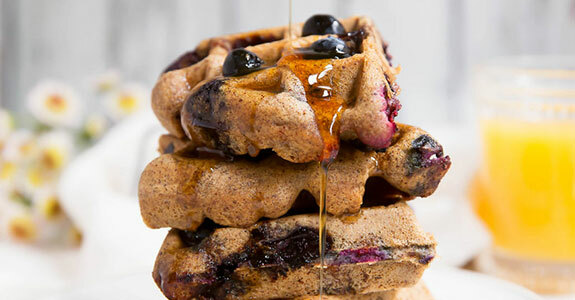 These delicious waffles have a rich and creamy flavor from raw cashews and almond milk, and a sweetness from honey, vanilla, and fresh blueberries. Looking for a blueberry waffles recipe for your Saturday morning breakfast feast? Look no further. Photo: I Can’t Eat What? Simple ingredients like almond or coconut milk, greens, frozen blueberries, and frozen raspberries are misleading in this recipe, which though easy, is actually incredibly flavorful and super nutritious! 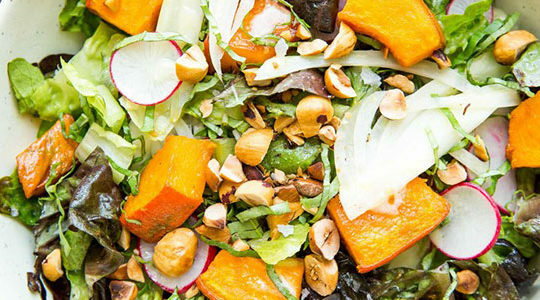 This simple salad needs only a handful of ingredients, but it’s super nutritious and tasty. Lemon, honey, and freshly cracked black pepper with olive make a n easy dressing, and the juiciness of the blueberries complements the texture and green flavor of the kale. Made without any nuts, these cupcakes use only coconut flour as their base and are sweetened with maple syrup. They would be perfect for a birthday party or a spring or summer celebration, with fresh blueberries and a coconut cream lemon frosting. Love fruit salsas? Me too. This one is both sweet and savory with ingredients like peaches, blueberries, pomegranate seeds, red onion, garlic, jalapeno, fresh basil and chives, lime juice, peach juice, sea salt, and freshly ground black pepper. I want this in my life. 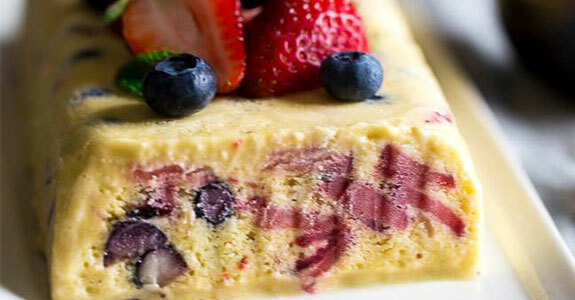 For the uninitiated, semifreddo is an Italian treat that translates to “semi-frozen” and is similar to an ice cream cake. This one has a lovely lemon flavor with strawberries and blueberries mixed throughout, and a decadent coconut milk creaminess. 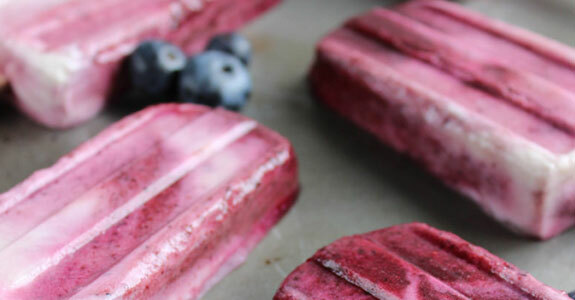 Here’s a simple blueberries-and-cream popsicle recipe that’s fun to make with the kids, and would be perfect for cooling off on a hot summer day when blueberries are in season. You’ll just need your berries, maple syrup, coconut milk, and almond milk. 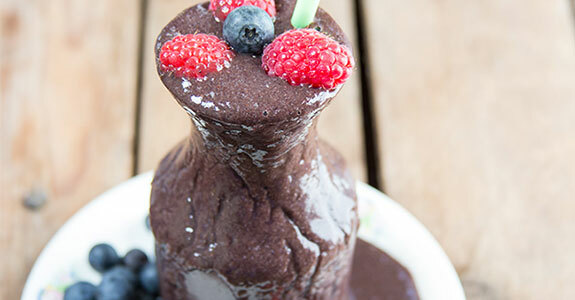 This easy smoothie has only four ingredients, and is packed with flavor and protein. It reminds me a little bit of a peanut butter and jelly sandwich! You’ll just need fresh blueberries, almond milk, almond butter, and dried prunes to sweeten it up just a touch. For a fancy-style semifreddo, try this version with blueberry puree, whipped coconut cream, a vanilla vodka zabligone, and a Swerve-sweetened meringue. All the parts come together to make a perfectly textured treat your whole family is going to love. These delicious individual-sized blueberry crisps are made with a paleo pre-made granola of your choice (or a homemade granola), frozen blueberries, tapioca starch, coconut flour, coconut oil, ground cinnamon, and a pinch of salt. With such a simple ingredient list, how can you not run to the kitchen and make these crisps right this second?